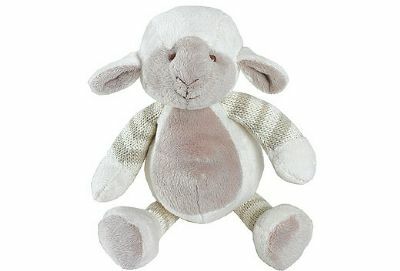 Neutral coloured gifts to suit any new arrival. 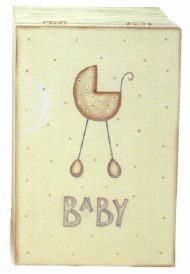 NATURE'S PUREST IS A GORGEOUS RANGE OF BABY ACCESSORIES MADE FROM ORGANICALLY GROWN, NATURAL COLOURED COTTON AND BAMBOO. PRODUCED WITHOUT THE USE OF HARMFUL PESTICIDES, CHEMICALS OR DYES. COTTON BUDS GROW IN NATURAL SHADES OF CREAM, BROWN AND GREEN. East of India Linen covered photograph album with wooden pram detail on front. By East of India. A stable with opening doors, Mary, Joseph, baby Jesus , 3 kings, 2 shepherds, a sheep, a donkey & a supply of paper 'straw' for effect. 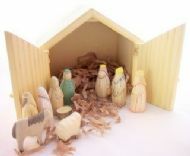 All can be stowed away in the stable when not on display. Stable size: approx L23cm x H20cm x D12cm. 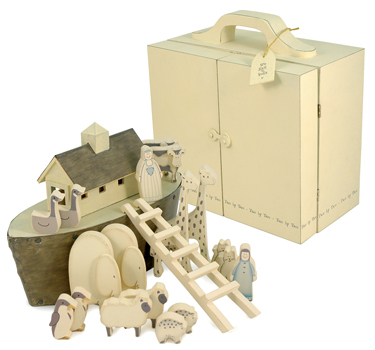 New for 2009, this East of India Noah's ark set is not a children's toy but looks fab on a nursery shelf. Comes complete with animals, ladder, ark, Mr & Mrs Noah all fits perfectly into the wooden case. 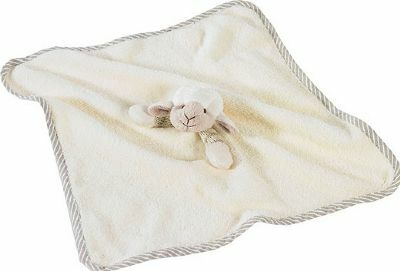 Super soft comforter with knitted lamb attached.